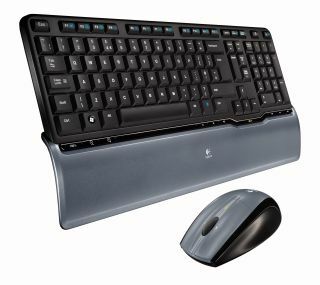 Over the next month, Logitech will be launching three new keyboards: the Illuminated Keyboard, the diNovo and the Cordless Desktop S250. No prizes for guessing the illuminated Keyboard's USP, but it's got a second one too – it's the thinnest design yet from the company at just 9.3mm from base to frame. This full-size backlit model is expected to sell for around £50. As with the diNovo, it offers Logitech's PerfectStroke key system, which promises that your typing experience will be 'comfortable, fluid and silent'! The black and silver diNovo is a style-concious design for use with notebook PCs and while no UK price has been set it's thought that it will sell worldwide for around €90. So in the UK's current economic climate, it will be losing value on a weekly basis. Logitech reckons you can get up to three years' juice out of its batteries, while the 2.4GHz wireless technology should reduce interference to protect you from drop outs and delays. Finally, the full-size, black and grey, Cordless Desktop S520 is the keyboard aiming to complement as many laptops as possible with its rounded edges and gentle curves expected to sell for around £40. It uses a cordless laser mouse that Logitech claims is smoother compared with optical versions. It also has four programmable F-keys and 1-touch access to Word, Excel and your internet browser.